Glen Mills, PA – April 24, 2017: For Axalta Coating Systems (NYSE: AXTA), a leading global supplier of liquid and powder coatings, sustainability involves a commitment to minimize the company’s environmental footprint across its entire spectrum of business activities, from product development and manufacturing, to distribution and waste disposal. Axalta’s Sustainable Star Award program, in its inaugural year, recognizes refinish customers in North America that implement sustainable initiatives to not only benefit the bottom line, but also assist in preserving the environment. 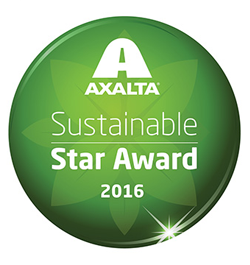 Axalta named Marshall Auto Body of Waukesha, Wisconsin the 2016 Sustainable Star Award winner. MILWAUKEE - May 2016 -- Three Wisconsin businesses were honored recently by the Wisconsin Partners for Clean Air for their voluntary efforts to improve air quality. Marshall Auto Body (Waukesha) was presented with a Recognition Award for their comprehensive and innovative operational improvements and generosity of assisting others in their industry. Added a third electric vehicle charger, a rapid charger. All chargers are solar-powered. Reduced fuel consumption, travel emissions and time spent by customers and vendors by improving processes such as electronic repair updates to customers, reduction in part returns, reduction in insurance re-inspections, and offering in-house services. The awards were presented on Thursday, May 26, during the 2016 Clean Air Extravaganza at Godfrey and Kahn's new LEED-certified office located at 833 East Michigan St. in downtown Milwaukee. The Clean Air Extravaganza is an event to celebrate the accomplishments of Wisconsin businesses and organizations that are improving air quality by reducing emissions from their facilities and fleets, improving energy efficiency, providing employee commuter options, and developing ways to educate the public about air quality issues. The Wisconsin Partners for Clean Air is a coalition of more than 250 businesses, community organizations, schools, and government agencies committed to improving air quality through voluntary action. December 2015 — It’s fairly common amongst collision repairers to categorize repairs by dollar value or “hours.” Many of us still identify four segments such as $0–$999, $1,000–$2,499, $2,500– $5,000 and $5,000-plus. These monetary delineations then serve to classify our work. These classifications then become the basis for scheduling, dispatching, sales analysis, etc. Does this make sense? NDEW2015 from Scott A. Marshall on Vimeo. See you all next year for the #NDEW2016 event! Until then, #ChargeOn! In today's fast-paced, get-it-done-today world, people often talk about recharging their batteries. That phrase has a whole different meaning to owners of electric vehicles. Electric vehicles, or EVs, get their day, er, week, in the sun during National Drive Electric Week Sept. 12-20, a nine-day celebration marked by events across the country to heighten awareness of vehicles that run on electricity, not gas. Locally, Marshall Auto Body in Waukesha will be hosting a Drive Electric event from 1 to 5 p.m. Saturday, Sept. 19, at the business at 22300 West Bluemound Road. For the THIRD time, Marshall Auto Body was presented with the Farmers HelpPoint 'Circle of Dependability' Wisconsin Repair Facility of the Year award in Recognition and Appreciation of Commitment to Service and Excellence. Without stopping for supplements, leveling work throughout the repair process becomes much easier. Are Fast Lanes Really Faster? Marshall Auto Body has been invited by Allstate Insurance to join their Auto Direct Repair Program of preferred auto repair shops. Waukesha, WI January 14, 2015 – Bodyshop Revolution North America announced the successful implementation of its unparalleled technology at Marshall Auto Body in Waukesha, WI December 2014. Bodyshop Revolution equips auto body shops with Greentech Dryers to increase efficiency and reduce cycle time by up to 60%, guaranteed! The company’s gas catalytic drying robots, panel repair tools and processes offer a continuous workflow environment which will reduce part replacement by up to 40% and dry paint in just 53 seconds. “The equipment works exactly as advertised. We’re saving half the time on drying fillers and paint,” stated Aaron Marshall, President of Marshall Auto Body in Waukesha, WI. The 13,000 sf shop, which employs 22 technicians and utilizes a water borne paint system . . . .
January 2015 — FenderBender asked me to contribute some insight with regard to the automotive collision repair industry and what we at Marshall Auto Body in Waukesha, Wis., have learned since we replaced our traditional value delivery model with the “teaching production system,” predicated upon the principles of Toyota, and tools adapted from lean manufacturing. 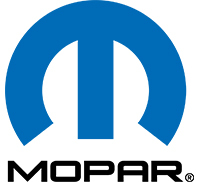 MOPAR is the parts, service and customer care organization within Chrysler Group LLC. 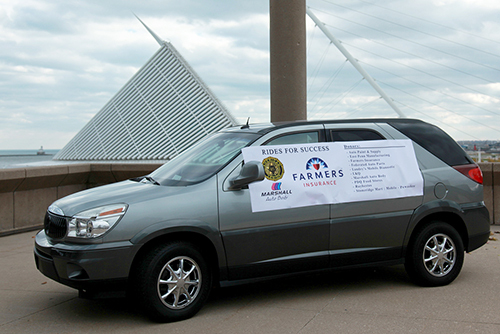 MOPAR also designs and builds a small number of customized vehicles. 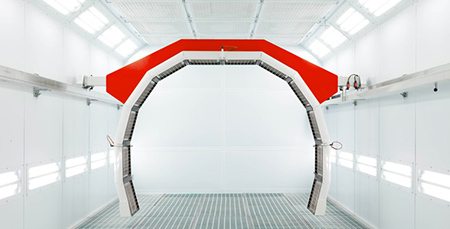 Sept. 3, 2014 — Marshall Auto Body will be among the early American pioneers in “robotic drying,” as the Waukesha, WI, shop is the first U.S. collision repair facility to incorporate the Greentech Dryers arch system into its painting process. Shop owner Aaron Marshall told FenderBender that the system—which is from Robotica's Exico line—will be “operational by [the] end of November, early December. June, 2014 - When a body shop owner bought a Tesla, he was wowed by the vehicle and its cutting-edge technology. His next thought was 'body shops will need to work on these cars!' 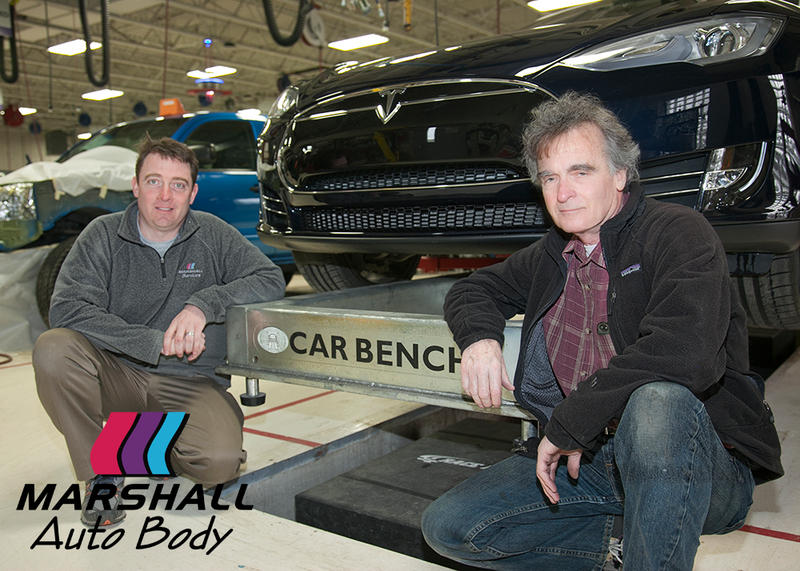 That's how Scott Marshall and his son Aaron, owners of Marshall Auto Body in Waukesha, WI, made the decision to become Tesla-certified and purchase the necessary equipment from Car Bench America, one of the world's leading manufacturers of high-end frame and measuring equipment for the automotive repair industry. 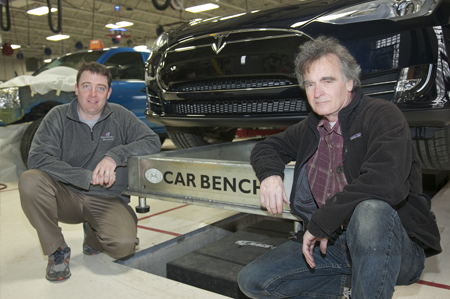 Aaron Marshall (left) and his father Scott Marshall are excited to be involved with Tesla and Car Bench, because the covet the car and the equipment, respectively. 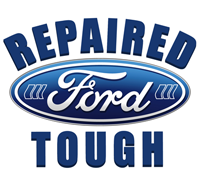 Marshall Auto Body has been recognized by the Assured Performance Network as one of the first ‘certified’ repair facilities in Southeastern Wisconsin for the all-aluminum F-150. The 2015 model will reduce the truck’s weight by 700 pounds from the 2014 model, improving fuel economy and allowing for a small displacement engine. MILWAUKEE, WI — Small businesses recognized this year include Lisa Geason-Bauer of Evolution Marketing in Oconomowoc, Marshall Auto Body in Waukesha and Nelson & Pade, a Montello company that specializes in the design of greenhouse aquaponic systems. 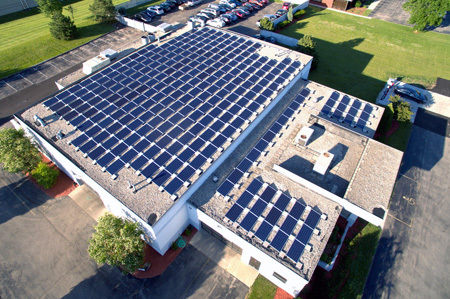 Marshall Auto Body was recognized for its work to reduce its carbon footprint through energy efficiency and solar energy production, as well as its work to eliminate waste throughout its operation by using lean business principles. Lake Forest, IL —These guys are not your typical shop owners. Not that there is such a thing. They have quite an assortment of skills and experiences in their background. It’s time again to feature a Green Masters Program Sustainability Champion! We love highlighting all of the great work that Green Masters Program participants are doing to drive sustainable business practices forward. So, without further ado, the Green Masters Program Sustainability Champion: Marshall Auto Body! Marshall Auto Body is based in Waukesha, Wisconsin, and specializes in as they say, “managing the time, quality, and cost of auto body collision repair.” Eight years ago, the company implemented a lean manufacturing system that helps them to find and eliminate waste, surface problems, and even increase utilization and throughput. Along with their work in eliminating waste, the company monitors their energy usage and makes that available online through their e-gauge. Marshall has partnered with H&H Group Holdings (another Green Maters Participant) to install solar panels at their facility. Their monitoring system allows them to plan for and minimize peak demand for energy consumption. Marshall Auto Body hopes to be carbon neutral by 2016. 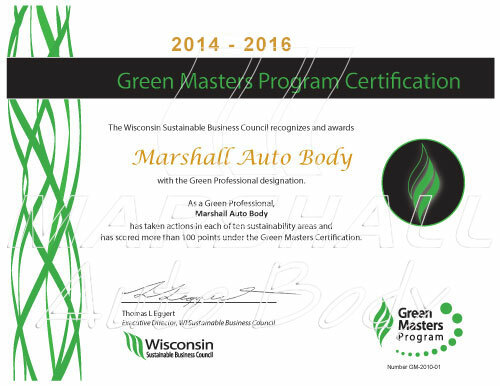 MADISON, WI —The new Green Masters Program application is out and one of our most recent applicants, having earned recognition as a Green Professional in their first year in the program, is Marshall Auto Body in Waukesha, WI. Marshall Auto Body is one of many small businesses that are participants in the Green Masters Program. In fact, as of the close of last year there were 168 participants. 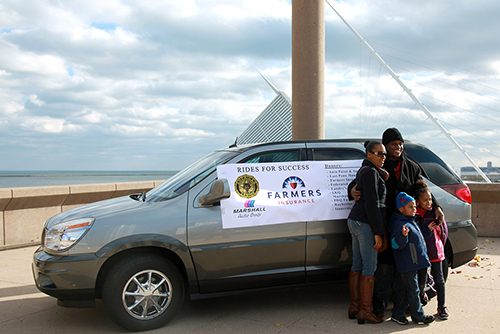 Iraq War Veteran awarded Buick Rendezvous after the 50th Milwaukee Veterans Day parade. 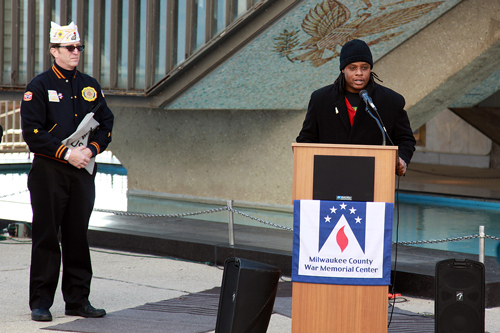 Milwaukee Iraq War veteran Alan Lewis was announced as the recipient of a Buick Rendezvous. 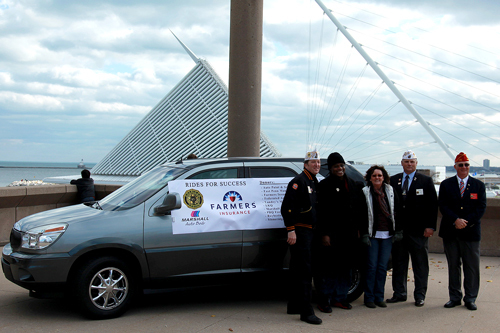 Alan's application was chosen by The Wisconsin American Legion and awarded the vehicle at a special ceremony after the 50th Milwaukee Veterans Day parade. 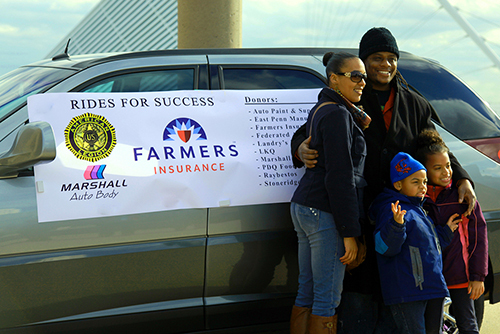 We were honored to participate with Farmers Insurance to make this event a success. Congratulations Alan! Eventually, Tesla owners will need to have their cars repaired, but there are only four certified Tesla repair technicians in the country. "We got an invitation from them," said company president Scott Marshall. 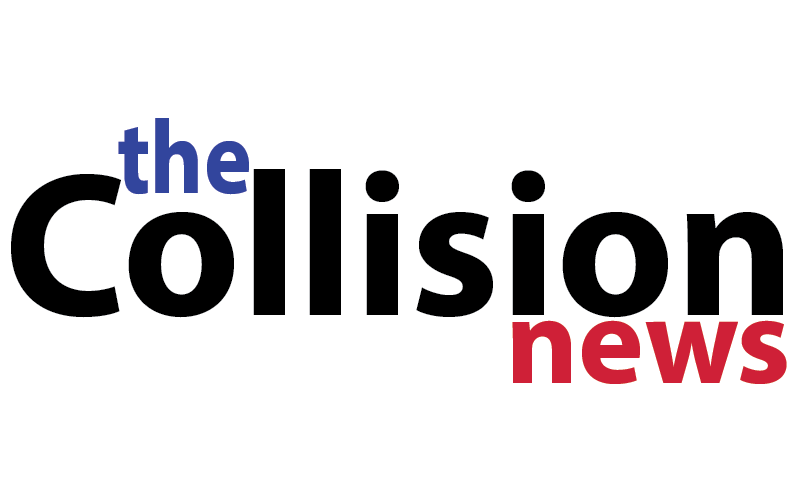 "They will not sell collision repair parts to anyone unless they're trained by Tesla. It requires a lot of skill and equipment to do it properly." Video : Celebrate National Plug-in Day! Celebrate National Plug-In Day by test driving a Tesla! WAUKESHA (WITI) — The third annual National Plug-In Day is being celebrated on Saturday, September 28th and Marshall Auto Body in Waukesha is offering the chance to test drive the Tesla and other electric vehicles. “We’re excited because this is a good chance for us to show everyone what these cares are like and what the future is like,” said owner Scott Marshall. Running entirely on electricity, the Tesla can go more than 250 miles on one full charge which costs about $10. Marshall Auto Body has gotten the attention of potential buyers, as well as manufacturers, by serving as an electric car charging site and investing in solar energy. Marshall Auto Body is one of only four auto repair shops in the country certified to service the Tesla. Press Release — Marshall Auto Body is proud to announce its partnership with Tesla Motors Company as the only authorized Tesla Motors repair facility in Wisconsin and the first of four shops in the United States invited to participate in a two week certification program by Tesla Motors . . . . The Tesla High Power Wall Connector is now available at our outdoor parking area. Completely recharge – from empty to full – in less than 4 hours. Also available is the Clipper Creek CS-100. A fast charge UL Listed, High Power - 18KW - 240VAC electric vehicle charge station. Named 2012 AutocheX Premier Achiever for Excellence in Customer Service and Satisfaction. 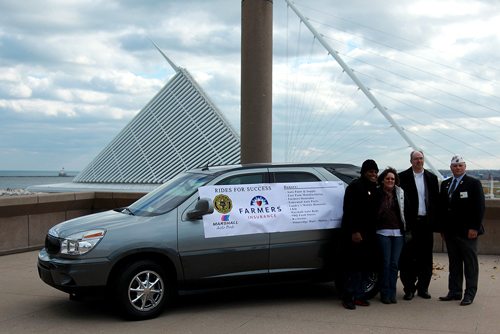 For the second consecutive year, Marshall Auto Body is a proud sponsor of Phase II of Waukesha Guitar Town project. The industry today is acutely focused on lean processes and removal of waste. "Customers and insurers want lower repair bills, and the only way to do that without hindering profitability is to get faster while reducing expenses," says Aaron Marshall, owner of Marshall Auto Body in Waukesha, WI. "Better materials management is one component of doing that." FenderBender magazine is proud to announce that it has selected eight leading industry professionals to serve on its 2013-2014 editorial advisory board. The board was developed to ensure the magazine offers the most relevant and useful content for shop owners and managers across the country stories that both inspire and offer real strategies for business improvement. Board members are shop operators from a range of independent and multi-shop operations. They were handpicked by FenderBender editors from a national pool of candidates nominated by industry peers and the magazine's editorial department. - Adam Grant, owner of Xtreme Collision Center in Morrisville, Vt.
- Brian Greenley, owner of Maaco Collision Repair Auto Painting & Glass in Littleton, Colo.
- Greg Hagan, director of D-Patrick Body & Glass in Evansville, Ind. 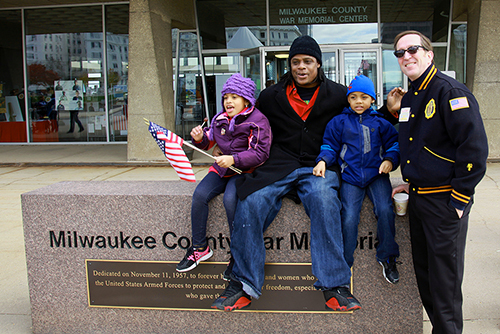 - Aaron Marshall, manager of Marshall Auto Body in Waukesha, WI. - Ronald Reichen, president of Precision Body & Paint in Beaverton, Ore.
- Frank Todaro, president of Schmidt's Auto Body & Glass in Buffalo, N.Y. Both Brian Greenley and Andy Tylka are returning board members serving a second term. Our emphasis on reader service makes the editorial advisory board a vital part of our team, said Jake Weyer, editor of FenderBender magazine. They are a direct link to the industry and each of them can offer valuable insight on the trends and challenges shop owners and managers see every day. For the second time, Marshall Auto Body was presented with the Farmers HelpPoint 'Circle of Dependability' Wisconsin Repair Facility of the Year award in Recognition and Appreciation of Commitment to Service and Excellence. COD Drive-In Claims. 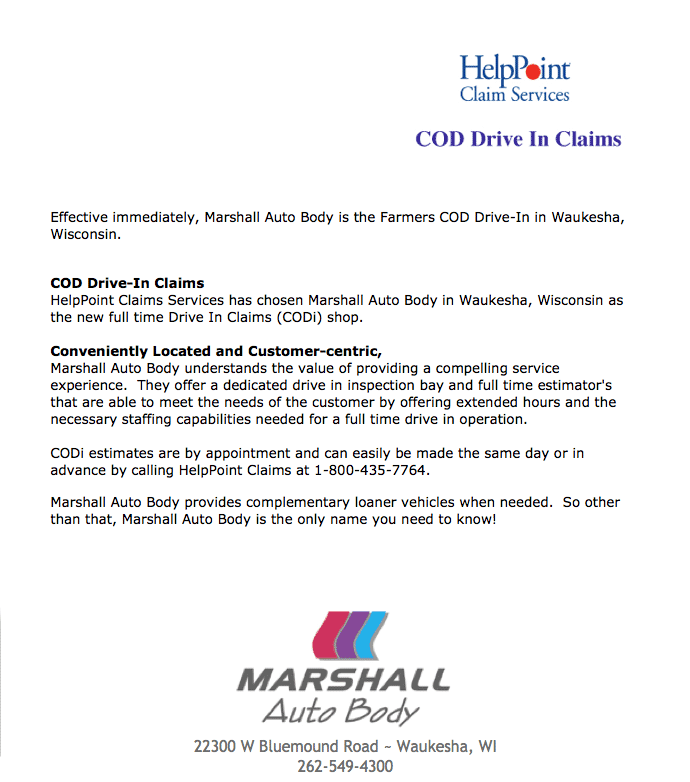 HelpPoint Claims Services has chosen Marshall Auto Body in Waukesha, Wisconsin as the new full time Drive Through Claims (CODi) shop. Conveniently Located and Customer-centric, Marshall Auto Body understands the value of providing a compelling service experience. They offer a dedicated drive in inspection bay and full time estimator's that are able to meet the needs of the customer by offering extended hours and the necessary staffing capabilities needed for a full time drive in operation. CODi estimates are by appointment and can easily be made the same day or in advance by calling HelpPoint Claims at 1-800-435-7764. Body Shop Business article by By Curt Hasler, Dave Weinstock. 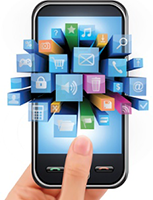 With growing smartphone usage, some body shops are betting that mobile apps will be big business drivers of the future. 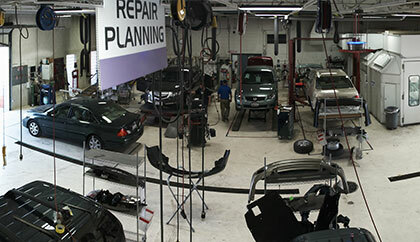 Trade Publication: The article describes the production area of the Marshall Auto Body repair shop after incorporating the lean process in its daily process in Waukesha, Wisconsin. Trade Publication: The article offers practical advice from Marshall Auto Body operations manager Aaron Marshall for those who wish to engage in lean manufacturing in the U.S. It mentions the need to understand the theory and implement the elements of a true value-focused process. It adds that shop owners should prepare to change the payment process and recommends to scrap any complicated system and paying straight hourly. Moreover, the need to anticipate some employee turn-over is also emphasized. As more and more people in our industry turn to lean solutions for their businesses, I feel a stronger urge to point out, in ever greater detail, the vast difference between how lean is practiced today and what it's original intent was. If you look at the origin of the term lean and its path back to Womack, Jones and the team that first published its findings in the must-read book, "The Machine That Changed the World", you'll see that it was created to describe the work those folks saw at Toyota. They observed processes that seemed to do more with less. But they only uncovered the outer layers of the system, which led them to reverse-engineering it based on those things that they could see. But the truth is that it's not so much what you can visually see but the thinking that's different, and it's that thinking part that has taken many years for us to both reveal and truly understand. Everyone we've worked with over the years who has strived to build a better business model has fallen into the same trap of mimicking only what they see. DuPont Performance Coatings (DPC) has partnered with Marshall Auto Body in a joint effort toward educating DPC customers and repair shops about lean practices. 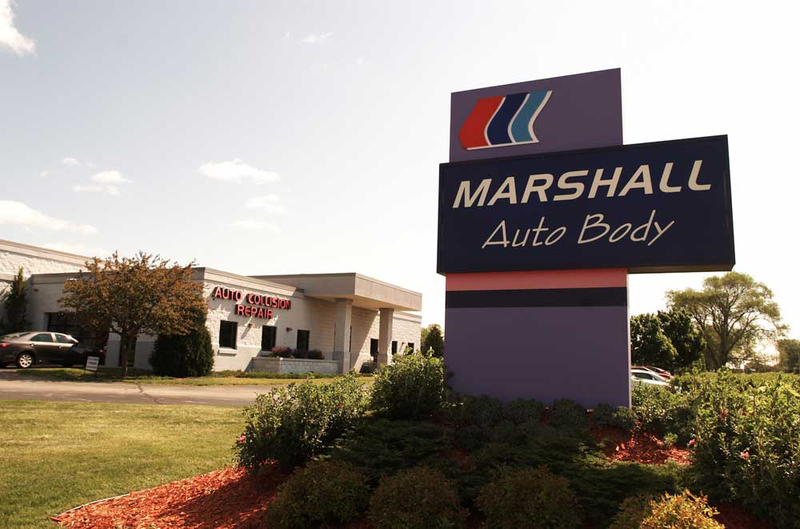 The agreement involves supplying refinish products and related supplies, and Marshall Auto Body will share its lean production-operating model they established nearly five years ago. Since then, Marshall Auto Body has seen reductions in cycle time, an increase in profitability and has plans to expand, according to Aaron Marshall, operations manager of Marshall Auto Body. "DuPont Performance Coatings chose to partner with Marshall Auto Body due to the results achieved using their pull-based, lean production operating model," said Steve Trapp, manager of collision services development. To learn more about DuPont Performance Services, go to pc.dupont.com. September 1, 2010 7:27 AM - DuPont Performance Coatings (DPC) has entered into a partnership with Marshall Auto Body, headquartered in Waukesha, WI to supply Spies Hecker brand refinish products and related supplies and also includes the sharing of Marshall Auto Body's proven pull-based, lean production operating model. Marshall Auto Body, started in 1978, operates an insurance and consumer-friendly collision repair center. Marshall Auto Body is a member of the growing Star-Link Repair Network, made up exclusively of repairers who are truly committed to lean thinking. "We are very excited by DuPont Performance Coatings' commitment to offering an innovative approach to lean transformation in our industry," said Aaron Marshall. "Since switching our operations nearly five years ago, we have seen significant reductions in cycle time and supplement frequency, increase in profitability and a huge boost in employee morale." "DuPont Performance Coatings chose to partner with Marshall Auto Body due to the results achieved using their pull-based, lean production operating model," said Steve Trapp, manager Collision Services Development. DPC also has added Aaron Marshall as an executive facilitator for DuPont's lean thinking courses and a design team member to DPC's lean implementation strategy team. Since signing the partnership agreement, DPC and Marshall Auto Body have been piloting some educational and consultative approaches to bring a unique lean transformation approach to the DPC collision repair customers. Look for future announcements from this partnership. To learn more about DuPont Performance Services, contact your local DPC jobber, DPC Representative or visit www.pcdupont.com. A look at front office procedures can reveal inefficiencies in the repair process. Marshall Auto Body was presented with the Farmers HelpPoint 'Circle of Dependability' Wisconsin Repair Facility of the Year award in Recognition and Appreciation of Commitment to Service and Excellence. June 3, 2009 2:14 PM - Here's how production has changed at a shop that's gone lean. In the case of Marshall Auto Body in Waukesha, Wis., journeymen techs were previously handed a list of jobs for the week, with paint and completion deadlines and one or more apprentices to help. Otherwise they managed the process themselves, ordering additional parts as needed and working with estimators on supplements. The shop routinely had 20 or more cars in the building. Now the shop usually has only 16 cars in the building, but is turning more work with less overtime. The shop's dozen production employees are assigned specific tasks. A parts person handles all ordering and detailed check-in of parts, with no job moving into production until all parts are in-house and insurance approvals obtained after the "repair planning" team has completely torn-down and "blueprinted" the job. Jobs move from that team to the "heavy" department where any structural or welding takes place, or directly into the six-stage flow line. That line consists of body work (all body filler work for the 185-200 cars the shop repairs each month is done in one station), priming, prepping, spraying, re-assembling and clean up. A new car enters that line every 80 minutes. If a technician in any of those stations is not going to be ready to move their car forward in the 80 minutes, they use a red light to signal they need help from others to keep the line moving. June 2, 2009 7:14 PM - The Early Days of Lean Transitioning to lean means tremendous change for management and employees. General Manager Amanda Grappone Osmer gives us a behind-the-scenes look at the early days of Grappone Collision Center's transition, and what the shop is doing to ensure success. Aaron and Scott Marshall along with two of their top technicians spent a week at a Collision Center in New Hampshire to train and implement the 'lean' methodology into their repair process. The movie below consists of a composite of images that shows a very brief synopses of the shop conversion. The images are only the tip of the iceberg compared to the many hours put forth in the 5 days that the conversion took place. June 2, 2009 8:30 AM - If the idea of yet another explanation of such "lean processes" as "5S," "constraints" and "blueprinting" has you moving on to the next article, stop for just a moment. Because beyond the symposiums, consultants, panel discussions and trade press attention focused on lean are some real-world shop operators ready to share their experiences " both good and bad " with trying a new model in their shops. Aaron Marshall has seen lean make a positive difference at his shops. Marshall, operations manager for Marshall Auto Body in Waukesha, Wis., touts some numbers that have to make even the most jaded give the idea of lean another look. Marshall said thanks to implementation of the Toyota Production System and related philosophies, the shop is now turning annual sales of $3.6 million; $200,000 more than two years ago, with one less production employee and 85 fewer overtime hours a month. Everyone in the collision repair industry has no doubt heard the buzzwords around improving efficiency. In this time of trying to avoid the spiraling whirlpool of the current business economy, the "buzz" has likely caught your attention. Catch phrases like lean process, cycle time improvement, repair blueprinting, eliminating waste, continuous process improvement, the five S's, and SOPs make up some of the buzz. What does this have to do with collision repair? A lot, if you pay attention to some of the success stories where the result means a less chaotic repair environment. Marshall Collision has been selected for the 2008 Best of Waukesha Award in the Auto Body Shops category by the U.S. Local Business Association (USLBA). The USLBA - Best of Local Business -Award Program uses online data to choose the winners in each category. The 2008 USLBA Award Program is focused on quality, not quantity. Winners are determined based on the information gathered both internally by the USLBA and data provided by third parties. About U.S. Local Business Association (USLBA) U.S. Local Business Association (USLBA) is a Washington D.C. based organization funded by local businesses operating in towns, large and small, across America. 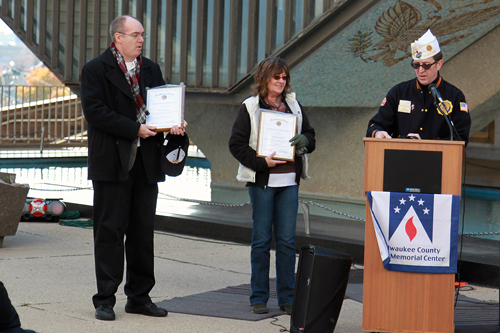 The USLBA was established to recognize the best of local businesses in their community. Our organization works exclusively with local business owners, trade groups, professional associations, chambers of commerce and other business advertising and marketing groups. Our mission is to be an advocate for small and medium size businesses and business entrepreneurs across America. Wisconsin Auto Body News Article : Future of Industry on Display at Marshall Collision Repair.